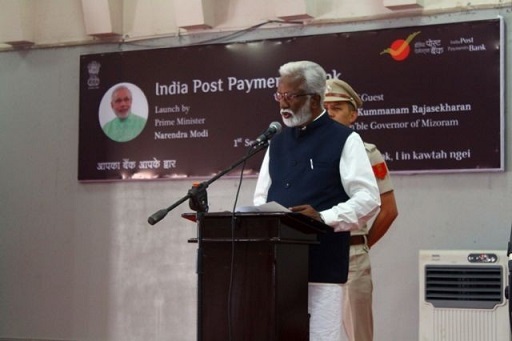 Mizoram governor, Kummanam Rajasekharanon Saturday launched India Post Payments Bank (IPPB) at Lal Thanhawla Auditorium in Aizawl. The governor said the department of Posts, with the support and backing of the central government has come a long way to launch its payment bank. He said it was a testament to Prime Minister Narendra Modi’s passion and zeal for progress and financial inclusion. He stated that with advancement in technology and digital networks, global connection and communication had become exponentially easier and faster, and no one wants to be left behind in the digitalised community. Rajasekharan said the IPPB’s objective of last mile financial inclusion and connectivity to the remotest parts of the country will truly give an important step in the country’s development and open a future full of promises and possibilities. The India Post Payments Bank will promote financial inclusion through financial literacy and educate customers on how even a small saving can go a long way towards building a better future. The India Post Payments Bank’s slogan, “Aapka Bank, Aapke dwaar” (Your bank at your doorstep) will be a reality, he added. Speaking on the occasion T Mang Min Thang, postmaster general NE-I, Aizawl, said a nation can only fully grow when every citizen gets an opportunity to prosper regardless of his way of life. He said the decision was taken in the backdrop of the changing banking and payment landscape in the country and therefore, the Payments Bank will give every Indian access to efficient banking service, the latest payment and banking technology, easy to use interface, trusted network of the post offices and its dedicated staff with local content. He also stated that 22% of the population live below poverty line and thus they and other large sections of the society do not have access to banking service. The IPPB will target the unbanked with doorstep banking, which will also inculcate a culture of savings which is found lacking here in the state. A total of six branches and 24 access points were launched simultaneously in Mizoram. By December end, the IPPB will go live in 39 Branches and 344 access points in Mizoram.